John Alan are delighted to act as sole agents in the sale of this ever popular 1930's three bedroomed end of terrace house situated in a popular tree lined road. This would make an ideal first time purchase. 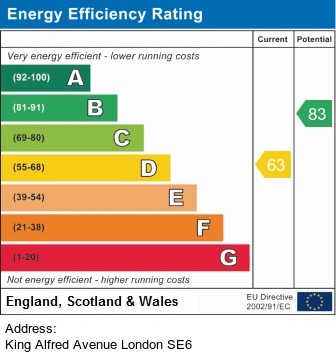 The benefits include full double glazing, gas fired central heating, potential to extend, subject to planning permission. Entrance: Via double glazed front entrance door from the side, laminate flooring, storage cupboard, further under stairs cupboard, fuse box. Downstairs Cloakroom: Low level WC, double glazed window to side. Lounge: 13'5 x 13'3 Double glazed door and two windows to garden, laminate flooring, wall mounted gas fire, picture rail, double radiator. Kitchen: 9'10 x 9'6 Double glazed window to front, range of wall, base and larder units with inset sink unit and mixer taps, plumbing for washing machine, worktops with post formed edges, Moffat four ring gas hob plus oven and extractor hood, radiator, tiled flooring. Landing: Carpet to stairs and landing, double glazed window on half landing to front. Bedroom 1: 13'0 x 11'5 Two double glazed windows to front, fitted carpet, radiator. Bedroom 2: 11'5 x 9'6 Double glazed window to rear, fitted carpet, radiator. Bedroom 3: 10'5 x 7'10 Double glazed window to rear, fitted carpet, radiator. Bathroom: Double glazed window to side, panel bath with mixer taps and shower attachment, wash hand basin, partly tiled, tiled flooring, heated rail. Garden: Approx. 45'0 x 35'0. Mainly laid to lawn, paved patio, side access.